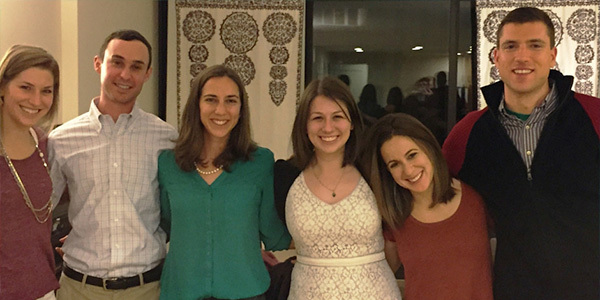 Shabbat Clusters are groups of 14-25 people in their 20s and 30s who meet monthly for informal potluck Shabbat dinners in each other’s homes or at local restaurants all over the DC Metro area. Shabbat Clusters have been going strong for over 10 years and in our last season 225 young professionals registered for the program. Please fill out the form and register for this session on the next page. We'll match you into groups based on where you live, your age, and level of observance and offer groups for singles and couples. Team up with your group to make kugel for those in need this Rosh Hashanah or enter our kugel contest and be crowned the Kugel Champ of DC. A harvest themed dinner to kick off the fall season! Thanksgiving-esque side dishes are a must! Celebrate the 4th night of Hanukkah with a festive meal - a latke & vodka bar and driedel contest! 2. You can choose between a general Shabbat Cluster or an interest Shabbat Cluster. We are bringing back Singles, outdoors, arts, foodies, 30 somethings, LGBTQ, Interfaith , and Jews By Choice interest Shabbat Clusters. We also still have couples clusters as part of our General Cluster offerings. Your Shabbat Cluster will meet through the summer/fall. In March 2018 we'll launch a new session of Shabbat Clusters. Check out the Shabbat Clusters FAQ to get answers to some common questions. EntryPointDC will host a Kickoff Shabbat Dinner on September 15 at 7:30pm at the DCJCC for participants who register for Spring Shabbat clusters. If you want to attend, make sure you register! The dinner is a great way to meet the other people in your cluster, as well as other young professionals participating in this fun program! We always need people to help out at the Kickoff Dinner. Please email Becca if you can help set up, clean up, or check your new friends in at the door! PLEASE FILL OUT THE GOOGLE FORM IF YOU ARE INTERESTED IN SHABBAT CLUSTERS THIS SEASON OR WOULD LIKE INFORMATION FOR NEXT SEASON. WE HAVE VERY LIMITED SPOTS OPEN CURRENTLY. OUR ONLINE REGISTRATION IS CLOSED BUT WILL BE IN TOUCH IF WE HAVE A SPOT.